Formerly known as Thong Bay and Nongduang, Villa Lao is a property with character. Built in the 1950s, it offers a unique experience for travellers though the increased rates make it hard to fully recommend. As the name suggests, the two buildings feature traditional French-Lao architecture, with wooden floors, shuttered windows and breezy common space with garden views. The deluxe rooms on the second floor have a colonial home feeling and they are the best, with small balcony, big windows, natural light, air-con, TV, fridge and desk. The bathrooms are looking tired though. The superior and standard rooms are grossly overpriced: They are plain basic boxes with a small window, white walls, tile floors, fluorescent lighting and zero charm or warmth. Only stay in this room if you plan on spending most of your time in the garden, which is the big selling point of this property. The private, tranquil garden has chairs, loungers, hammocks and picnic tables. Breakfast is included in the price, but bicycle rental is not which is cheeky considering guests need it to get around – do they really need to charge the extra dollar? We enjoy this place; some may find it too basic and too far from the centre of town – about 1.5 kilometres. Those appreciating gardens over rooms will love this place, but in terms of value, take the deluxe room or stay elsewhere. Auberge Sala Inpeng and Lani’s House by the Ponds have a similar feel and are better. 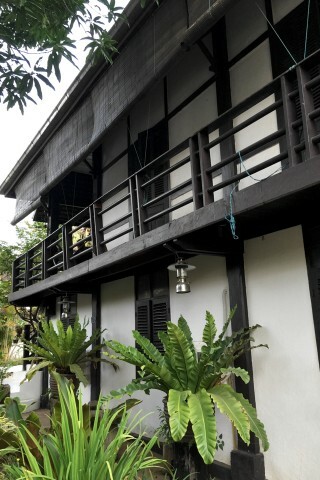 Check rates at Villa Lao Traditional House (formerly Nongduang) on Booking.com.